Crime | Park View, D.C.
Public Safety, and effective ways to ensure it in our communities, is something that is important to everyone. Here is an opportunity for residents to get engaged, show support for efforts that are working, and offer feedback on strategies that are falling short. 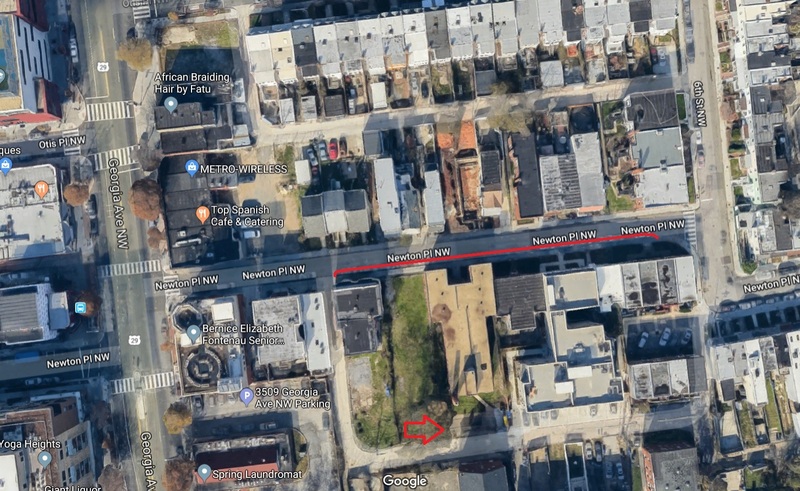 Councilmember Nadeau has announced the date and location of her 4th Annual Ward 1 Public Safety Meeting which will be on Tuesday, April 30th on U Street. We’ll have a new format this year based on feedback from previous years. We’ll open at 6:30pm with an open house featuring representatives and brief remarks from MPD Commanders, the U.S. Attorney’s Office, the Office of Neighborhood Safety and Engagement, Collaborative Solutions for Communities, the Ward 1 NEAR Act Study Group. Each representative will have a table and residents can mingle and ask questions. Then at 7:30pm, we’ll be joined by neighborhood MPD officers for those who would like to meet an MPD officer who works in their neighborhood. The 600 block of Newton Place, NW, has been a difficult street for many years. It is narrow. It does not have street trees. And, it has had an on-again, off-again history of open-air drug dealing. We all know that crime is a complicated thing to solve. Clearly, the police play a role, and continue to do so on Newton Place. Social Services also play a key role and we are increasingly identifying public safety issues that are better suited for agencies geared toward addressing addiction and homelessness, as examples. But what about planning and design? The short answer is yes. Poorly planned roads, streets, and infrastructure can similarly invite criminal activity or at least provide a desirable environment for it. The 600 block of Newton Place is one area that I believe rises to this threshold. One recent Saturday as I was walking down the block, I noticed that a brand new Audi A6 was parked on the block, about mid block, with out to District tags. As I was walking, another vehicle with out of District tags parked on the block. The new driver got out of their car and walked up to the Audi where the two then proceeded to conduct a drug transaction. This was shortly before noon. It got me thinking — if the on-street parking on the block is being used as part of an active drug market, is it serving the community? Moreover, would there be a significant hardship to the neighbors if much of the on-street parking was removed? Even more, if the parking could be removed, could a portion of it be repurposed for street trees on a block where no street trees currently exist. The overview below shows the area in question. Today, Newton Place is one-way eastbound. There is no parking on the north side of the street and 22 parking spaces on the south side of the street. Of the 22 parking spaces currently on Newton Place, I would recommend keeping the five between Georgia Avenue and the entrance to the alley. These support the Ward 1 Senior Wellness Center and the businesses on Georgia Avenue. Also, any resident can park in them afterhours for free. Lastly, as trash and recycling is collected in alleys in Ward 1, keeping the street in its current configuration up to the alley entrance would not create a new hardship for these core city services. This would leave 17 parking spaces that could potentially be removed. In walking the alleys both north and south of Newton Place, with few exceptions each property has access to off-street parking. Much of it is used, though some of it isn’t. 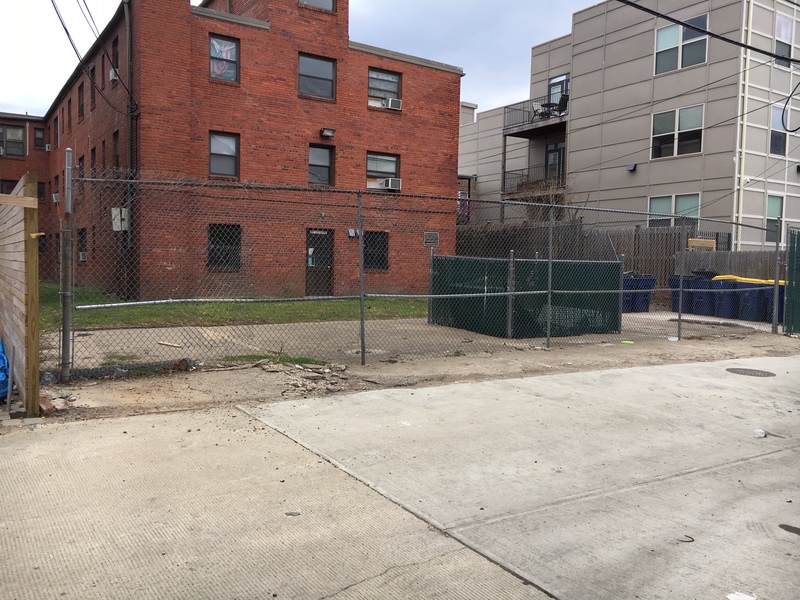 In one case, the apartment building at 636 Newton Place appears to have room for 4 or 5 parking spaces, but the area is fenced off and currently unavailable. This wouldn’t have to stay this way. In reviewing the current inventory of current and potential alley parking for the properties along Newton Place, about 10 new spaces could be accommodated without significant hardship — this means that the net loss of parking would be 7 spaces. The question becomes, would losing 7 spaces overall on Newton Place be an agreeable trade off if it also removed the opportunity for out of District vehicles to park there and conduct their drug business on a daily basis? As a potential bonus, presuming there were wide support for decreasing on-street parking on Newton Place, a portion of the former parking area could be repurposed for about 8 new street trees (see image below). As stated at the beginning of this post, Newton is a narrow street currently consisting of one travel lane and one lane of parking. The average width of an American car is 6 feet, meaning that if just 3 feet of the street formerly dedicated to parking were repurposed for a line of street trees, the travel lane would increase in width by 3 feet. The overall result could be a street with less crime, a safer street for travelers, and a more beautiful street with the addition of a tree canopy. Adding more to the conversation about gun violence in the surrounding community, the latest Fourth District Weapon Recovery email from Saturday, April 20th, is below. 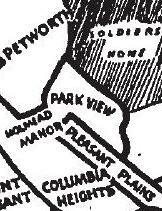 As has been pointed out to me, it is interesting that all the listed locations this time are in the Park View, south Petworth area. Every day, the Metropolitan Police Department works to recover and investigate illegal firearms in Washington D.C. In addition to our patrol officers, the Department has specialized units—such as Crime Suppression Teams (CSTs)—who work tirelessly to safely and respectfully secure illegal firearms and get them off of our streets. On Friday, April 19, 2019 , the Fourth District Crime Suppression Unit recovered 5 firearms off the streets in the Fourth District. The Metropolitan Police Department also recovers firearms with the assistance of anonymous tips made through MPD’s anonymous tip line. Anyone who has information regarding gun recoveries should call police at 202-727-9099. Additionally, information may be submitted to the TEXT TIP LINE by text messaging 50411. The Metropolitan Police Department currently offers a reward of up to $2,500 to anyone who provides information that leads to the recovery of an illegal firearm hidden in the District of Columbia. At approximately 4:04 pm, members of the Fourth District responded to the 700 block of Princeton Place, Northwest for the report of a shooting. Upon arrival, officers located an unconscious juvenile male inside the home, suffering from several apparent gunshot wounds. DC Fire and Emergency Medical Services arrived on the scene and the victim was transported to a local hospital and succumbed to their injuries. I am grateful to both Patrol Chief Lamar Greene and Forth District Captain Sean Conboy who called me on Friday to brief me on the incident and discuss overall efforts to address crime in the neighborhood. Regarding what neighbors can do to assist with solving Friday’s homicide, I’ve been informed that while canvassing the neighborhoods, detectives observed security cameras affixed to residences that are within a four block radius of the offense. Many of those cameras are registered with the Capital Shield Program. If any resident has video that you think may assist with the investigation, please contact me at 1A08(at)anc.dc.gov and I can provide you the contact information or put you in contact with directives working on this case. Chief Newsham also personally responded on Friday, and below is his statement from the scene. 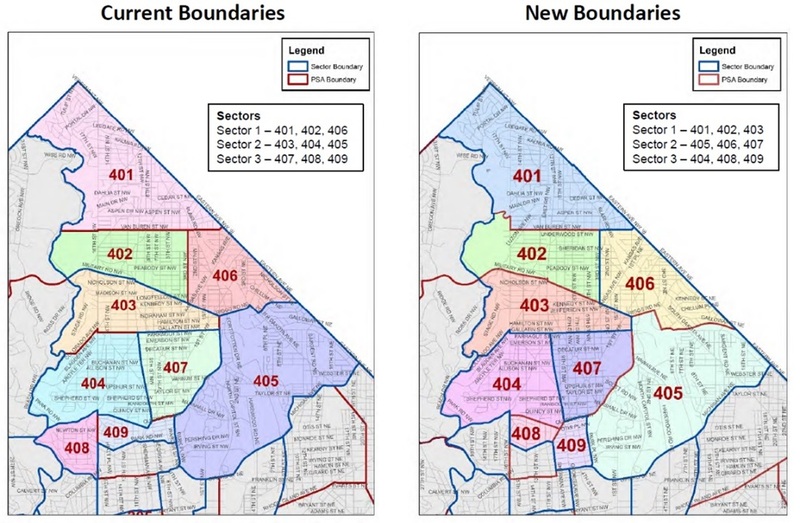 At last night’s Advisory Neighborhood Commission 1A meeting, Fourth District Captain Sean Conboy — who is new to the Fourth District — briefly discussed the changes to the Third and Fourth Police Districts announced last month and informed the assembly that they take effect today, on January 10th. He also stated that no staffing changes are being made right now, so essentially the same manpower will now be focused in the same PSA geographic areas (though those area’s boundaries have changed). The Mount Pleasant neighborhood moved to the Third District. To assist with what areas are impacted and what the Police Service Areas boundaries are, refer to the two maps below. You can also find contact information for officers on the Fourth District Roster, available here. 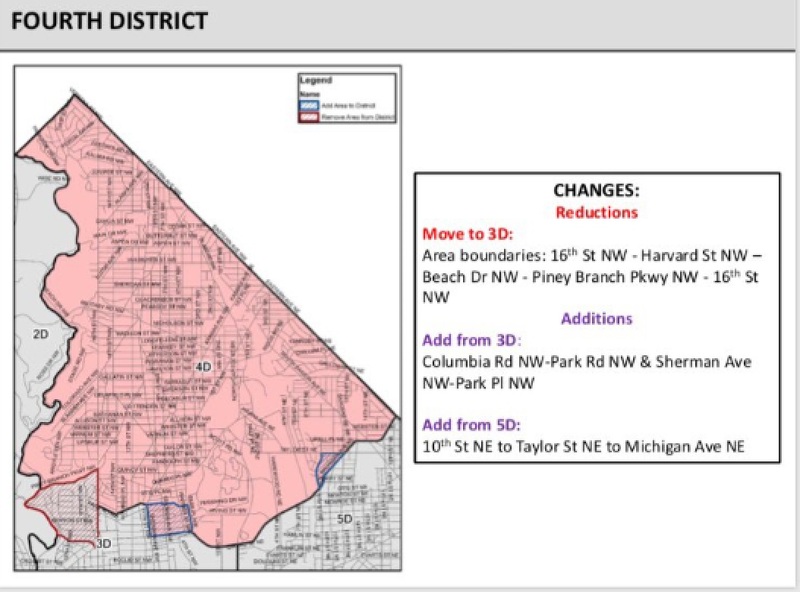 According to a Tweet by Kevin Donahue, Deputy Mayor for Public Safety and Justice, Police Chief Peter Newsham discussed the planned police district boundary changes that will go in effect in January with Mayor Bowser and the Council of the District of Columbia at their breakfast on Tuesday, October 24th. 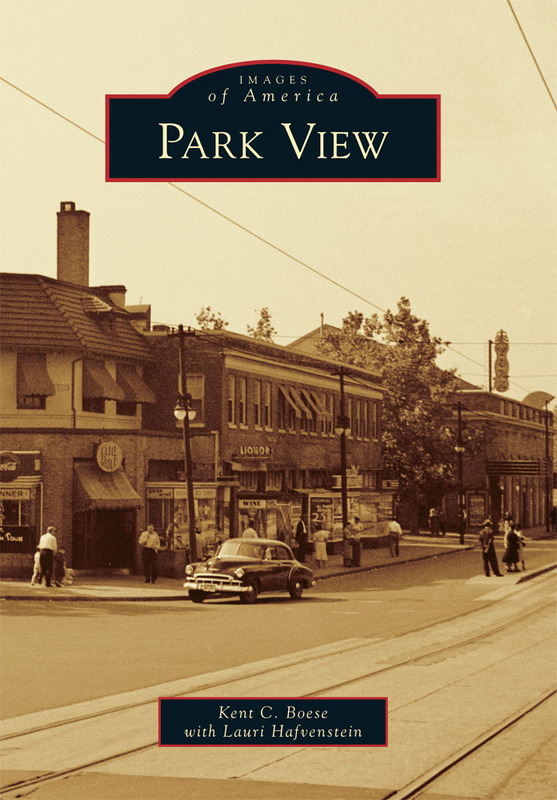 In looking at the images Donahue shares, for Park View the area bordered by Columbia Road, Sherman Avenue, Park Place, and Park Road would move from the Third District to the Fourth District. See below. 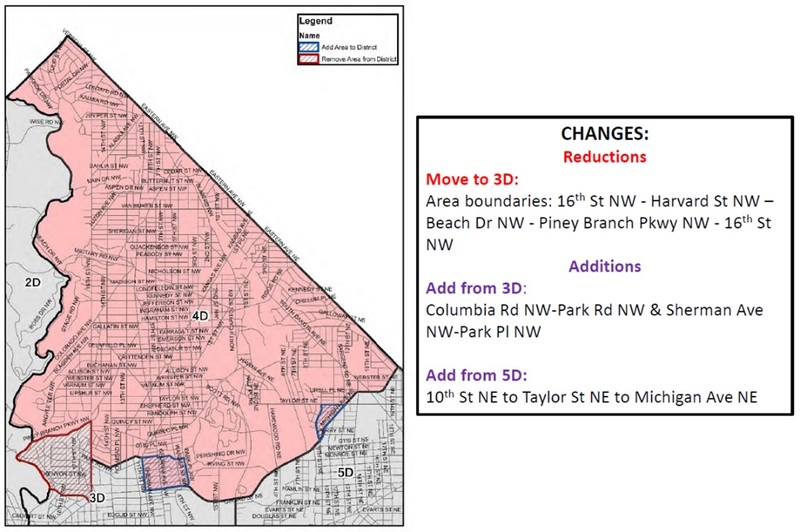 Another big change is that Mount Pleasant would be moved from the Fourth District to the Third District.